Has your computer caught a nasty virus? We can nurse it back to health! PC running slower than it used to? cleanup and removal is our specialty! 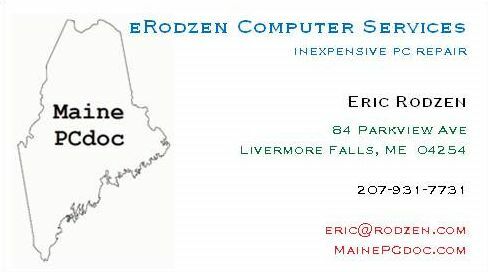 low-cost local PC support in central Maine? Hardware and software troubleshooting, $35 per hour*, nights and weekends! Networking your home computers to share the internet, your files and printers, is no problem. We can also assist you in getting a good deal on a new computer or upgrades within your budget. Want to have your own place on the net? Don't know where to start? We can help! As little as $50 can get your site up and running. includes the programs that I use on your PC when I clean it for you. Vipre is the antivirus program I rely on at work and at home. and install it if you like, just ask me about it! or give me a shout and I will do it for you.